While you may think that the opener is what supports most of the weight of your garage door, that's actually not true. The springs are the ones who are owed a thank you. These hardworking components are under constant stress, and when they do end up breaking they'll need to be replaced by a professional with a lot of skill and experience. We've got just the team for the job. There could be a few different reasons for this, but the most common one is simply wear and tear. Garage door springs, by their nature, are susceptible to constant wear, and even with regular maintenance and adjustment, they'll still end up breaking eventually. It's very important that you don't try to handle them yourself when spring replacement is due, as there are very real dangers in dealing with these units. Extension springs are the veteran of the two types that are used today, but they are often not the preferred choice. They work by stretching and contracting, which means their wear out faster and their service life is shorter as a result. Torsion springs work by twisting and unwinding, i.e. torque, and their built to be more durable and flexible, and also less likely to whip around when they do break. Each type requires different amounts of headroom and backroom, though, so as the saying goes, what might be right for you may not be right for some. Whether you just discovered that a spring broke and you need to replace it, or your door is unbalanced and some adjustments are required, wait. 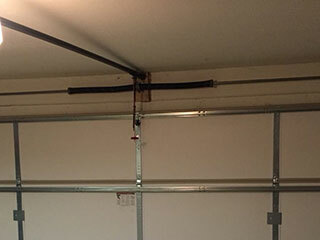 Don't rush into trying the DIY approach when it comes to garage door springs. These units can be very dangerous to handle, and professional training is usually required to deal with problems regarding them. Our experts at Garage Door Repair Walnut Creek will gladly come to your house and take care of the spring replacement work without putting anyone at risk. Our same day service policy means you won't have to wait around very long. Contact us today for any related need.